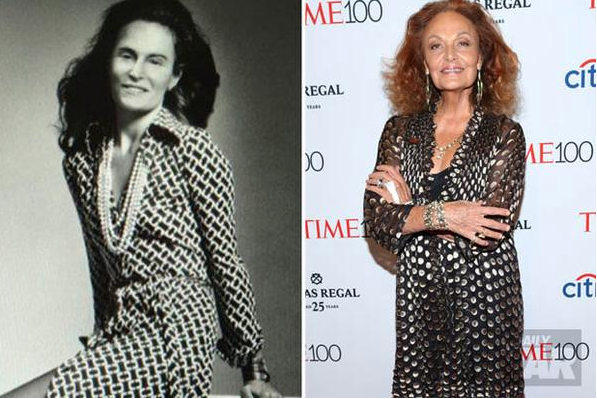 Diane von Furstenberg criticized for photoshopping Bruce Jenner's head onto a body wearing one of her famous wrap dresses. Diane von Furstenberg shared a bizarre photo of Bruce Jenner’s head photoshopped onto her body on her Instagram page on Tuesday. The fashion designer quickly deleted the controversial image, but not before fans captured a screenshot of the picture. See the photo below. 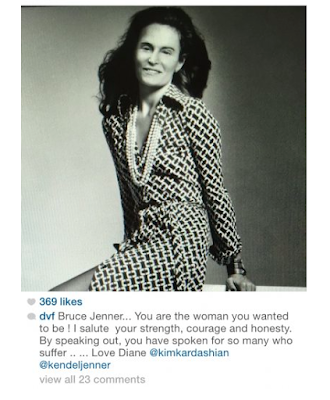 Furstenberg is actually very close with the Kardashian and Jenner family. Kendall has walked in several runway shows for Furstenberg. Interestingly, the photo Furstenberg used to photoshop Jenner’s head on was from a 1974 ad for her clothing line, featuring the tagline, “Feel like a woman –wear a dress.” As Gossip Cop previously reported, Jenner officially came out as transgender during an interview with Diane Sawyer on Friday, saying, “For all intents and purposes, I am a woman.” What do you think about Diane von Furstenberg’s now-deleted Instagram post with Bruce Jenner?